YORK REGION – As any real estate sales representative will tell you, cultivating a gorgeous garden is one of the best ways of boosting your home’s curb appeal (and value!) during the competitive spring and summer real estate markets. For aspiring gardeners, one of the greatest incentives for getting into this rewarding hobby is the sense of community it inspires, and the opportunity to connect with other homeowners who share the same interest. Luckily, York Region offers a variety of community programs to help make gardening more social, and even provide some recognition for homeowners who go the extra mile in beautifying their neighbourhoods. In an effort to encourage garden improvements across the region, and to reward those who have often put a huge effort into their yards, some York Region municipalities have introduced garden recognition programs to highlight local properties with exceptional greenery. The Susie Garden Program allows City of Markham residents to nominate exceptional local gardens for special recognition – whether the properties containing them are residential, commercial, or industrial. The owners of Susie-recognized gardens receive a special certificate, a sign for their front lawn, and an invitation to the Susie Garden Program Social, held annually during the fall. If you’d like to get involved and nominate a garden in your own neighbourhood, you don’t even have to get up – nominations can be easily submitted via this handy web form on the City of Markham’s official web site. Richmond Hill’s own garden recognition initiative is a little more focused on boosting curb appeal – the garden under consideration must be located at the front or side of the property in order to qualify. Plant selection, arrangement, and colours are other key factors in picking nominated gardens for recognition. The Front Garden Recognition Program is also nomination-based, and features a convenient online form that you can use to nominate neighbours’ gardens. The nomination period ends on July 1, and later in the month, volunteers from The Richmond Hill Garden & Horticultural Society will be hitting the pavement to evaluate and select nominees. With sporting venues located all over the GTA – including some notable ones in Markham like the Angus Glen Golf Course – the 2015 Pan Am / Parapan Games promises to be one of York Region’s biggest and most exciting events to date. Register your garden at www.seedsforchangegardens.org. Plant at least three food-producing species in your backyard, terrace, or community garden. The whole point is to promote local, organic produce, while encouraging participants to share the word (and their fresh produce!) with friends and neighbours in the same community. It’s also a great way to add some colour and biodiversity to your own backyard! Looking to meet other local gardeners in a more low-pressure, educational environment? 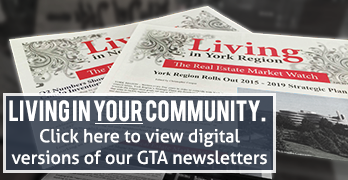 It’s worth taking an occasional look at York Region’s online events calendar. The Region frequently presents workshops and classes for aspiring gardeners, on subjects ranging from plant selection, to pest management and permaculture. Many are free to attend, but it’s always a good idea to check the event page and register online in advance!